Object of the invention is an electrode meant for use in laboratories of clinical neurophysiology as an aid in diagnosing diseases of the nervous system related to impaired conduction along the pain and temperature sensation pathways. 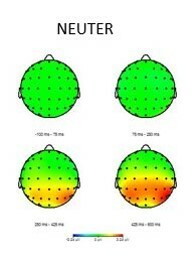 Whilst electrodes normally used in neurophysiology are unselective, that is they stimulate all of the underlying nerve fibres when a suitable current is applied, our device allows selective stimulation of a definite group of fibres characterized by small diameter and slow conduction velocity (classified as Ad and C fibres), the very ones that conduct pain and temperature sensation. Core of the invention is the peculiar arrangement of multiple conductors in contact with the skin, in comb-like fashion, and with interrail distance of less than 200mm. Assessment of the healthy condition of nerve fibres is currently performed by electrical stimulation of the nerves at one point and recording the proximal response. 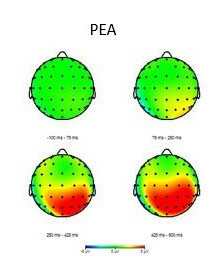 With these methods only the large fibres conveying sensation of touch, limb position and movement (Ab) can be assessed. They have the lowest electric threshold and are the first to be activated by impulses delivered through skin electrodes. Because the “tail” of the response from the Ab fibres interferes with the recording from the slower Ad and C fibres, the latter cannot be investigated with the usual methods. The only way to solve the puzzle is to perform a selective stimulation of Ad and C fibres. Painful thermal stimulation by laser pulses or fast contact heaters is the only method so far demonstrated effective to this end, though hampered by critical drawbacks that have limited its use: skin burns, poor synchronization and high costs of equipment are the most relevant. Luckily, the Ad-C fibres have one anatomical property that offers a solution for the use of electrical stimuli. On the skin they are more superficial than the lower threshold Ab fibres. So, if an effective electric field could be limited to the most superficial layer of the skin, that is the epidermis, a selective activation of the Ad-C fibres would be possible. A few attempts to obtain such goal had been performed, but they failed either in selectivity or efficacy. The configuration of our electrode has been designed to achieve very large gradients of the electric field within the epidermis only, targeting the Ad and C fibres, while lower gradients in deeper skin layers fail to reach the activation threshold for the Ab fibres. The electrode is composed by a number of “units” consisting of two parallel conductors with a gap of 100-150 mm, connected to opposite poles. The electric field profile through the skin depth is principally linked to the interrail gap of each unit, and not to the number of units nor to the length of conductors. As a consequence, the surface of the electrode, and the amount of addressable Ad-C fibres can be increased at will, increasing efficacy without affecting selectivity. Our invention is the first to accomplish all the requirements for a safe, non invasive, instrumental assessment of small nerve fibres with excellent feasibility in any laboratory of neurophysiology, at a very limited cost. It is foreseen that a relevant step forward in diagnosis of many pain conditions will be attained by the widespread use of the device. The invention stems from a collaboration among scientists of the CNR-SPIN Institute (Dr. Luca Pellegrino, CNR-SPIN, luca.pellegrino@spin.cnr.it ) and the University of Genova (Prof. Massimo Leandri, Int. Centre for Pain Neurophysiology, massimo.leandri@unige.it and Prof. Antonio Siri, Dept. of Physics, siri@fisica.unige.it). A patent has been jointly filed by CNR and UNIGE in June 2014. Lately, an agreement for exclusive licence of the patent and know-how has been signed with Bionen, an Italian manufacturer of accessories for neurophysiology. 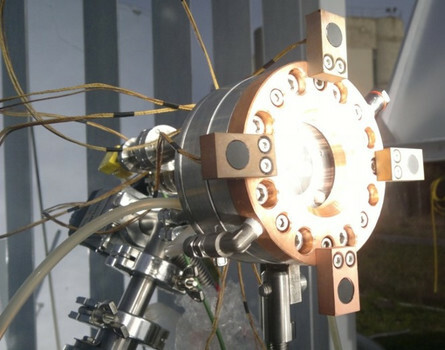 The invention introduces a new solid-state power conversion technology for concentrated solar systems, able to operate at high temperatures and cogenerate efficiently electric and thermal energy. The concept is innovative and the related technology is based on a combined thermionic-thermoelectric converter, consisting of: 1) thermally resistant bulk selective radiation absorbers, able to operate at temperatures larger than 1000 °C and surface-textured to obtain a solar absorptance close to 100%; 2) low work function coatings, acting as efficient thermionic emitters at moderate operating temperatures for a thermionic energy converter; 3) solid-state thermoelectric generators and materials. The ST2G conversion module is made up of a first element able to efficiently transform concentrated solar radiation in thermal energy (the absorber), followed by thermionic energy conversion stage and a thermoelectric generator. The “core” of the module is an engineered ceramic material (carbide in the developed demonstrator): the surface exposed to radiation is “textured” by the use of ultrashort laser pulses according to a spatial periodicity in the hundreds nanometers range. This surface treatment induces a significant increase of solar absorbance (>93%) and absorption selectivity. 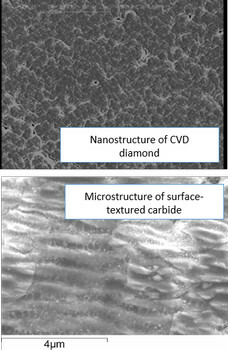 By means of chemical vapor deposition (CVD) techniques, a thermionic emitter coating (CVD diamond films in the demonstrator), operating in the 700 – 1000 °C range, is deposited on the surface not exposed to solar radiation. A metallic collector harvests electrons emitted by CVD diamond. Emitter and collector interaction allows the first transformation of thermal energy into electrical energy.A thermoelectric generator, thermally in series with thermionic stage, exploits Seebeck effect to generate electrical energy at lower temperature (<450 °C).Solar-to-electric energy conversion efficiency of the ST2G can be as high as 40%, with a 70% of thermal-to-thermal cogeneration efficiency on the exhaust heat. 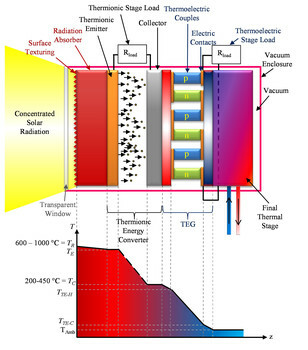 The thermoelectric stage can be substituted by a thermodynamic stage (Stirling, Rankine, turbine) or by an energy storage system, that is fundamental to guarantee continuity of energy production and dispatch with the intermittent solar energy source. The present invention claims a method and related system for measuring physiological parameters of a human subject undergoing an olfactory stimulation comprising one or more smelling olfactory stimuli, where by means of said system and according to said method a human subject is undergone to said olfactory stimulation by sending said one or more smelling olfactory stimuli to the human subject; one or more physiological parameters of the human subject are recorded; and said olfactory stimulation and physiological parameters recording are synchronized. The purpose consists of allowing the display of a marker being produced by the trigger of the olfactory stimulation by means of an amplifier interfacing the trigger with the electroencephalographic recording. Moreover, it will be thus possible to standardize the methodology of virtual olfactory stimulation to known visual or auditory stimulation methodologies, for which the synchronization of the sensory stimulation events is implemented by specific stimuli presentations software. The present invention is based on the general consideration that the disadvantages and/or limitations of the methods and systems according to the prior art can be overcome or at least partially solved by means of a system wherein the sending of the olfactory stimuli to the human subject is interfaced by means of a marking on the acquisition system of the electroencephalographic signal. Subsequently, this allows a direct averaging processing on the pattern to assess changes induced and/or modulated by the olfactory stimulus administered in a temporal range marked on the pattern and with a stimulation intensity measurable and changeable by the experimenter. 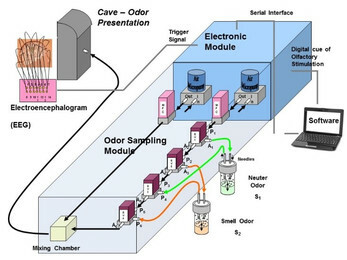 To this end, the present invention is based on the further consideration that by digitizing the operations by means of the use of programmable means automating and regulating the whole procedure of administration of the olfactory stimuli and of acquisition of the encephalogram data, it is possible to obtain the desired synchronization and then even more reliable results. In particular the procedure (measurement) provides the regulation in terms of intensity and duration of the different olfactory stimuli which the human subject is subjected to. 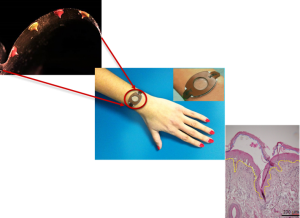 S. Coppola, R. Vecchione, E. Esposito, C. Casale, V. Vespini, S. Grilli, P. Ferraro, P. Netti, “Electro-drawn drug-loaded biodegradable polymer microneedles as a viable route to hypodermic injection” Advanced Functional Materials 24, 3515-3523 (2014). Cell-based therapies represent an important strategy to restore the function of injured cells, tissues and organs. However, the limited availability of functional cells has hampered the success of this strategy. The recent advances in stem cell biology offer an opportunity to address this challenge. Embryonic stem (ES) cells have a great potential because they can proliferate indefinitely and, at the same time, retain the developing potential to generate cells of all three embryonic germ layers. However, ES cells do not maintain their pluripotency during expansion passages on standard plastic culture, but tend to differentiate spontaneously. A feeder layer or different growth factors, are routinely used to counteract spontaneous differentiation and to promote ES cell self-renewal. Such feeder has been the major obstacle to obtain clinically significant cells due to safety issues (e.g. pathogen contamination, immunogenicity of the feeder layer), difficulty in quality control, and high expense. A great challenge lies in identifying simple, repeatable, cost-effective, and optimum substrates capable of feeder- and serum-free culture conditions of stem cells. Our invention consists in the fabrication of 3D microstructured substrates for the expansion of stem cells while keeping their pluripotency. 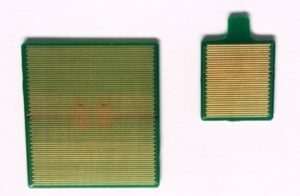 The microstructuring is produced by two-photon polymerization, an additive manufacturing technique based on femtosecond laser irradiation, that can produce structures at the nano/micro-scale. A 3D scaffold with an engineered layout is fabricated on a glass substrate, covering most of its surface. 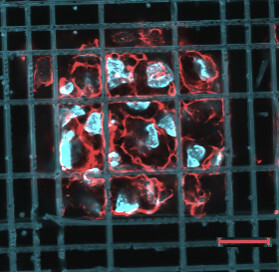 The implemented scaffold is a matrix of artificial niches that induce a physical confinement to the stem cells as that experienced in physiological niches. Thanks to the 3D layout of the scaffolds, we have proven that stem cells can proliferate without differentiating. M. Mello, M. De Vittorio, A. Passaseo, M. Lomascolo, A. de Risi, “Optical system for CO and NO gas detection in the exhaust manifold of combustion engines” Energy Conversion and Management 48 (2007) 2911–2917. The real-time control of gas emitted by internal combustion engines, is a well-known problem in the automotive field. The possibility of a real-time feedback and control adjustment of the combustion parameters inside the combustion chamber would allow the optimisation of the entire process, also in transient condition. Nowadays the only sensor mounted on vehicles is the lambda-sensor, that allows the real-time O2-control, while the emission control COx and NOx exhausted gases is done in a labs or garages, where chemiluminescence and absorption instruments are used. Today testing regulated by the European Union is based on CO2 and Pollutants (substances like CO, HC, NOx and particles) to ensure cars do not emit over the limits allowed. 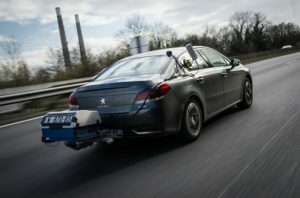 After the Dieselgate, new test will be complemented by the ‘Real Driving Emissions’ (RDE) test to ensure that vehicles deliver low pollutant emissions, not only in the laboratory but also on the road. WLTP (Worldwide Harmonised Light Vehicle Test Procedure) will apply for new types of cars from September 2017 and for all car registrations from September 2018. The invention relates to a new optical system able to detect the concentration of gaseous species, and more specifically combustion products. A working prototype implements the invention of a new optical sensor for exhausted gases, such as COx and NOx and O2, which overcomes the disadvantages of the known current techniques. It is resistant to high temperatures and permits real-time monitoring of the parameters in a combustion process. 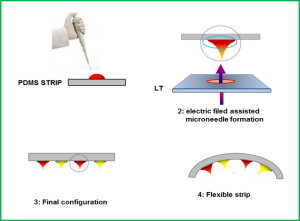 It is based on the photodetection of said products, adopting some particular nitride compounds as active material. 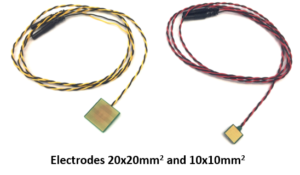 The operating temperature of the sensor preferably lies between 400°C and 700°C, but the resistance of the active material permits to be used at even higher temperatures. This system can be used to measure the concentration of chemical species present in combustion products directly at their outlet, where its high operating temperature makes it possible to avoid fouling of the sensor caused by carbonaceous and non-carbonaceous deposits.